Very happy Shirley atop pitch 2 of Mountaineers Route (Jul. 2004). 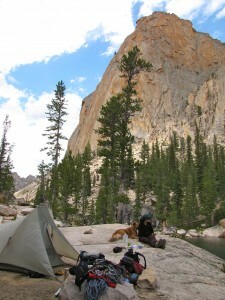 Shirley & I “discovered” Sawtooths climbing by skimming through Alan Kearny’s guidebook back in ’03. Two photos in that book captured our attention. 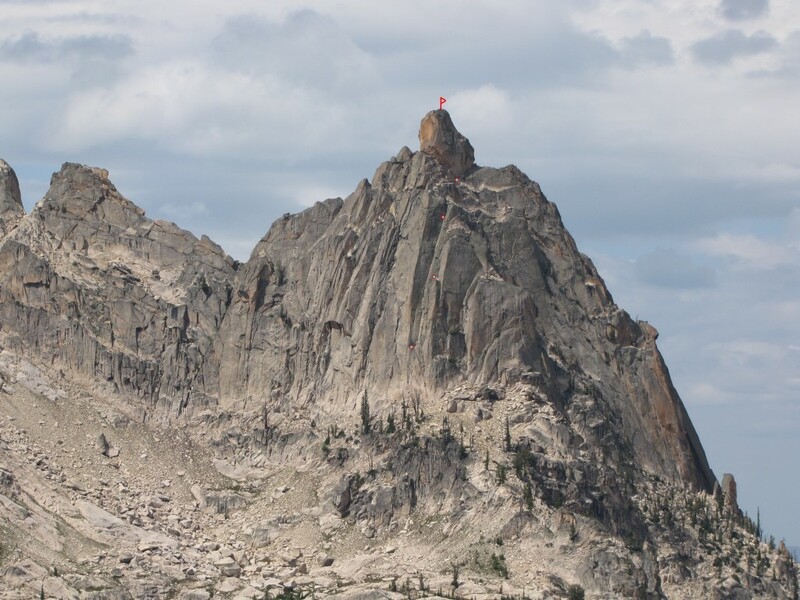 The first was a shot of a climber standing on the summit horn of Warbonnet and the second was a climber following the dihedral pitch on the Mountaineers Route of Elephants Perch. 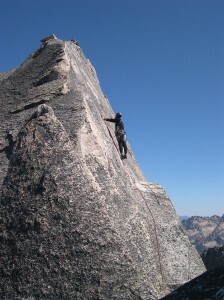 Over Labor Day Weekend that year we set out and climbed the easy route on Warbonnet. Indeed, the climbing did not disappoint and certainly neither did the views! Ever since, we’ve averaged more than a trip per year to this gorgeous area with some failures (most of those have been on the Finger Of Fate…weather, crowds, laziness, mosquitos….each noun represents an attempt/trip by the way…and I don’t think I’ve included all of them…can you say “bad luck” ?). One of these days we’ll get the Finger! Got the Finger in July 2012…a high five! Shirley on pitch 1 of Sunrise Book (August 27, 2005). Shirley & Blondie chilling in camp by Saddleback Lakes. Elephants Perch is in the background (July 2011). 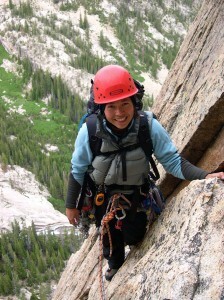 Leading summit pitch of Warbonnet (Labor Day 2003). Southeast face of Elephants Perch and the four routes we’ve done. 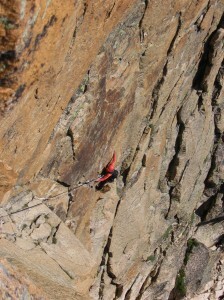 Splitgerber-March (III 5.10-) is way over on the left beyond Mountaineers Route. 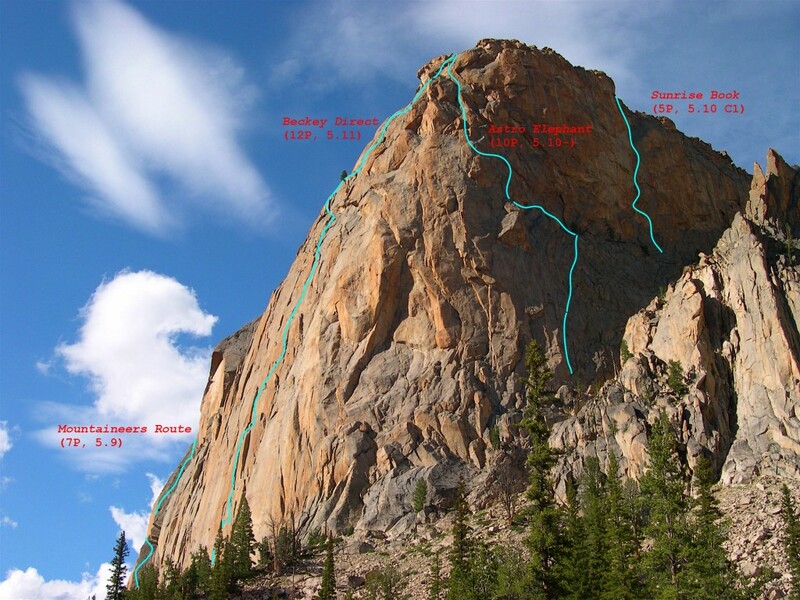 Southeast Face (III 5.9 A0) on Baron Spire. See full res. (Sept. 2009). 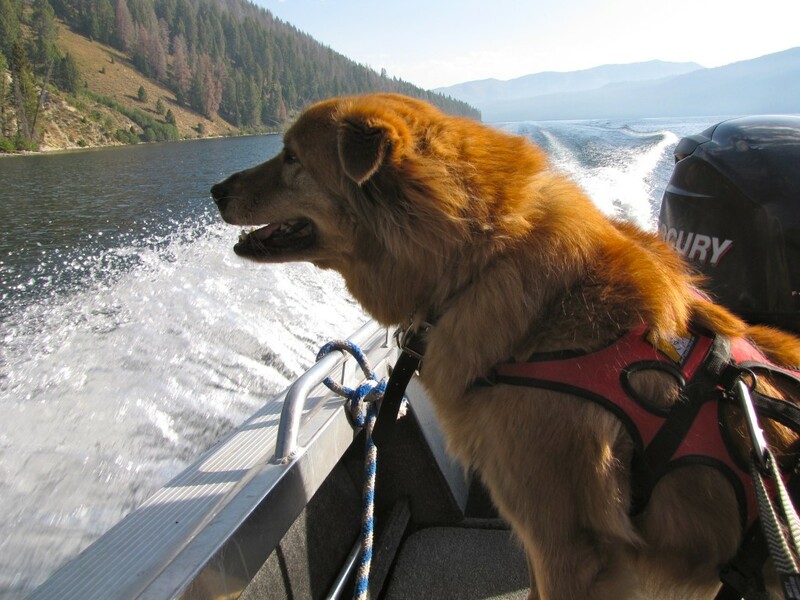 The boat! The boat!! The BOAT!!! Redfish Lake on Labor Day Weekend in 2012.